Launch a ball onto the table and aim for the high score. 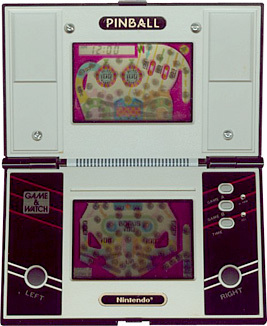 You control the flippers that appear on the top and bottom screens. Keep the ball in play and don't let the ball fall down the gate or the alley between the flippers on the lower screen. Different areas of the table have different scores associated with them. You can score a maximum of 999,900 points. You start with three balls, and play them one at a time. If you lose all three balls then the game ends. You start with just one ball, and a new ball is put into play at 10,000 and every 20,000 points thereafter, with up to three on the table at a time. The game ends when you lose all the balls on screen.